I have been involved in Magento development for almost a year now. God knows I had (and still have) my moments of pain with it :). If you are in professional, everyday, PHP development that focuses mainly on Magento then your life probably isn’t all flowers and bees. Magento is extremely rich eCommerce platform, but its main downside IMHO is its size and code complexity. If you download Magento via SVN, you will sound find out it has around 11 600 and more files. This is no small figure. Transferring that much of files over the FTP can be a real night mare. Luckily we have SSH and tar command to handle this really neat. But what about database. Today I worked on database with more than 20 000 products in store and with extremely large number of categories. What seemed like easy database transfer from live site to local developer machine to do a test and fix on few issues tunerd out to be an issue for itself. Without further delay, here is my favorite tool to handle all database related work from now on: Navicat. Among my favorite features is the Data transfer. Directly moving one database to another among different MySQL servers works like a charm. I find yourself strangled among often database recommended action I suggests you test the trial version of this tool. 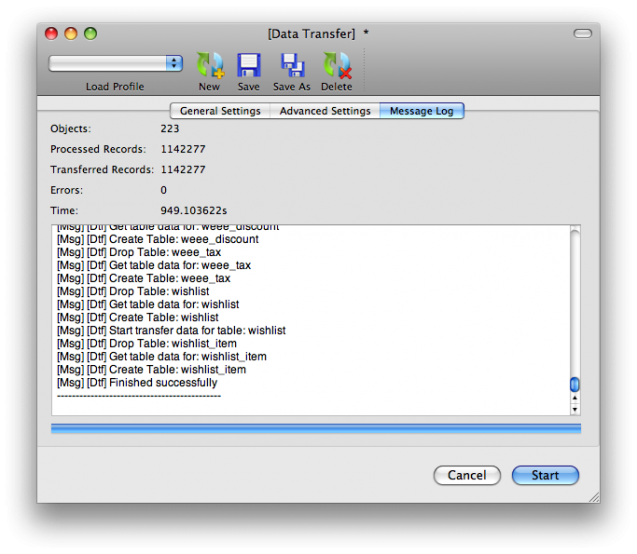 Here are some screenshots of Navicat Data transfer in Action. Are there any tables in Magento, that can be safely truncated, before you transfer the database from live to development? You can also use the “official” tool for it: MySQL workbench. Do you know a way to add just the catalog products and categories I had in the old one, in a new magento 1.7 freshly installed? That would be easy, and apart from the products there isn’t much to redo. All I need is to import the right table files and the old magento media folder files, but I don’t know exactly what.. Thanks very much for your prompt answer, I need to do this to save 6 months of work.. do you have an e-mail adress or IM adress we can chat over? In case I’ll be stuck.. I don’t know if this will help you, but I have been made good experience with it. I’ve tested a lot of PHP based tools to do a backup of my Magento CE 1.4.2.0 Database. Nothing will work fast enough or I run into time outs. Last thing I think is to do it via SSH console directly trough MySQL tools like mysqldump/mysql. that point to your new WebServer. Don’t forget to delete your var/cache/* Folder. After setting up my local.xml file in app/etc/ all runs fine. In Magento CE 1.4.2.0 there is a nice tool to clean your database a bit. and you can clean it a bit out to save space. I have a big problem, I need to urgently restore my magento shop with all the content. Before I ruined everything I made a backup of the whole magento folder and a sql/xsv export of the database. Now I placed the magento folder in my httpdocs as it was before, and I imported the sql dump file in the database. But when I try to open the website it doesn’t work, or sometimes the database seems to auto update with tables and only a standard magento home page comes up. What should I do?? Thanks a lot! I know this is an old post, but I hope you monitor comments. I’ve used navicat for years (just not with crapgento). I cannot get data transfer to work (without crashing magento). I’m still using SQL dumps. 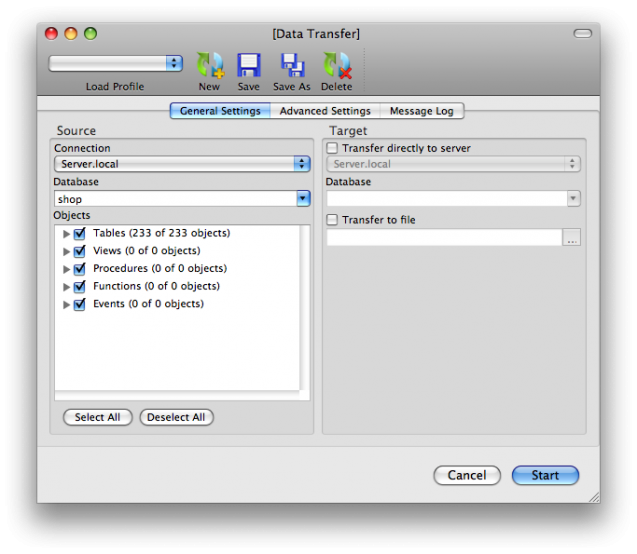 There’s another panel of options in navicat’s data transfer dialog, you didn’t take a screen shot of. It has the nitty gritty details of the data transfer (like fk constraint, autoincrement, etc). Can you please post what extra options you’re using, because the defaults don’t work for me. @Scott I fully agree with SSH and god knows I do lot of my export import with of database with pure console mysql tool. However, sometimes it gives me such a headache. @B00MER I love open source, I am for open source, but being open source sometimes is not enough. Personally I love NaviCat because I had great experience with it and it does the job for most of the time. In professional web development price of 100-200$ for a software should not be high if the software is stable and does the job.